Duncan's Air Conditioning & Heating Inc. Check all electrical components, connections and amp drawls on all electrical parts. Lubricate all moving parts, check small parts such as contactors, relays, capacitors, heat sequencers and all safety switches. Check thermostat calibration, brush clean all indoor coils and clean all outdoor coils. Clean and clear drain lines and check Freon charge. You become a preferred customer in emergency situations. Ultimately you pay less yearly. 10% off on repair service (parts). Lower energy costs by up to 10% by keeping the unit running at peak performance. Keeps warranties valid as it is a requirement to maintain the unit. Agreement is transferable if you move. We will contact you via a reminder postcard. It will be mailed to you bi-annually! Reduce worry and unexpected service calls and repairs. drawls on all electrical parts. coils and clean all outdoor coils. • Clean and clear drain lines and check freon charge. • Ultimately you pay less yearly. • 10% off on repair service (parts). the unit running at peak performance. requirement to maintain the unit. • Agreement is transferable if you move. postcard. It will be mailed to you bi-annually! Your choice to do yearly or bi-annually. $99 per visit per system. choose to service your unit twice a year. $99.00* per system per visit. Priced to be determined upon visit. *Maintenance Program does not include filters or parts. We do offer filters at an additional charge and parts are 10% off for our maintenance customers. *Maintenance program is a yearly program expiring one year from your previous maintenance. 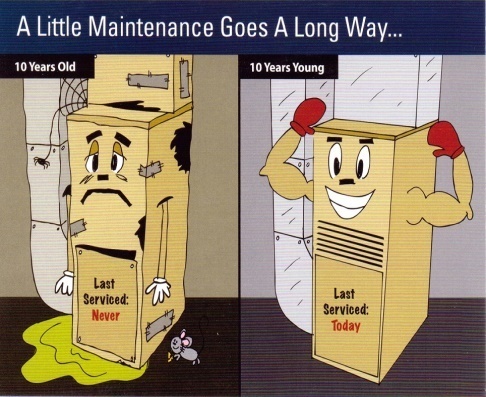 We provide you bi-annual reminders via postcard if you choose to service your unit twice a year. *Maintenance's are paid at the time services are rendered. We no longer offer prepaid maintenance's. *You will receive a reminder postcard when your system is due, PLEASE CALL US AT YOUR EARLIEST CONVENIENCE to get your system scheduled to have a maintenance done. Don't hassle with trying to find the right size filters for your unit! Duncan's AC can have your filter shipped to your front door. Call for details!